For music fans in the Northwestern United States, summer festival season officially kicks off Memorial Day weekend at The Gorge Amphitheater. That weekend hosted Sasquatch Music Festival for a magical 17-year run, featuring artists from Coldplay and The Foo Fighters to Mumford and Sons, Outkast, and REM, to name a few. 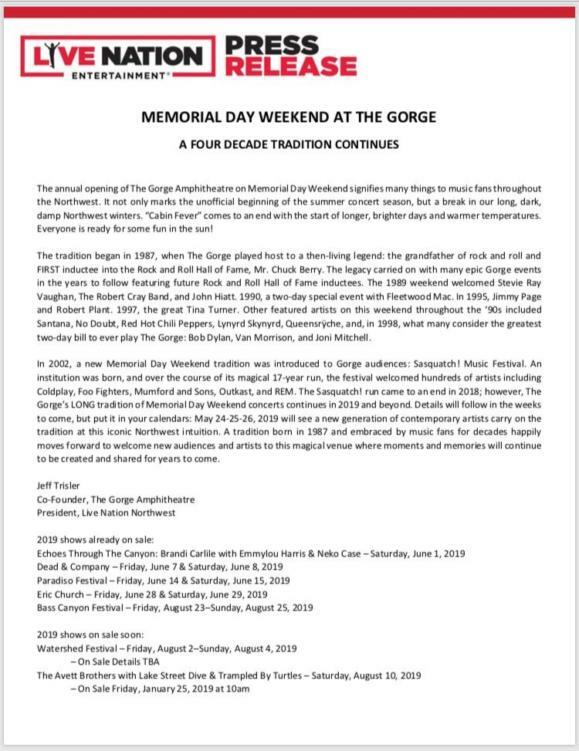 With Sasquatch joining the laundry list of successful events heading to the festival graveyard last year, something needed to be done to restore the decades-long tradition at The Gorge for 2019 and years to come. Enter: Live Nation, who has just issued a press release that it would be helming the next great festival chapter at the live music venue resting just due east of Seattle. No other information has been released at the current time, but PNW fans can expect to see the inaugural line-up very fan.